Welcome to Cal State East Bay! As a transfer student, you are a valued part of our community as you join many other students like you who are committed to pursuing their educational goals. We recognize that transfers have different needs than first-year students, and we are here to make your adjustment and transition into our community as smooth as possible. Transfer Student Programs serves as a resource hub for transfer students to access the support necessary to achieve their desired educational goals. Smooth Transitions provides the support needed to transition transfer students to the university with a great sense of connection, engagement and involvement with the East Bay community through academic-related and co-curricular activities. Transfer Connections pairs incoming transfer students from Cal State East Bay's top four feeder community colleges with Transfer Ambassadors who previously transferred from their same institution. Having experienced the transfer experience firsthand, Transfer Ambassadors draw from their own experiences and available campus resources to create memorable experiences for incoming and first-year transfer students. Tau Sigma is a national academic society for transfer students who achieve a 3.5 or higher GPA during their first term at Cal State East Bay. The Eta Epsilon chapter of Tau Sigma was established in 2016 to recognize oustanding students who transfer to the university each year. Navigating campus on the first day of the semester can be daunting. But never fear we are here to help! Register for a classroom tour led by a Transfer Ambassador to learn exactly where you need to be on the first day of class. You’ll be stress free and arrive on time to grab a good seat. Tours are Jan. 14, 15, 16, 17 and 18, and choose a time that works for you from 9 am to 5 pm. 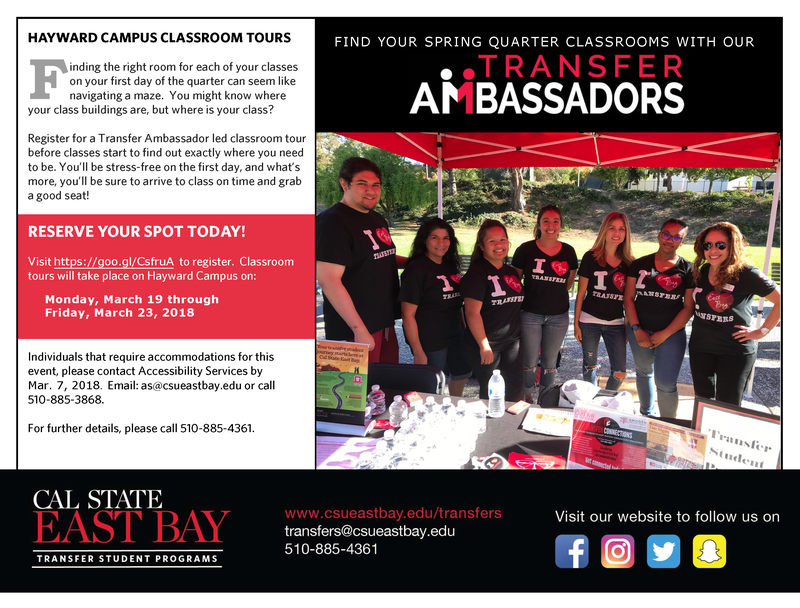 Contact transfers@csueastbay.edu or 510-885-4361.